There's more at stake than your bank account. If money talks, what's it saying about your marriage? Are the two of you on the same side of money matters, or are you often in disagreement? Mastering Money in Your Marriage gives a plan for making healthy financial decisions and strengthening your relationship at the same time. You'll be glad you made the investment. After graduating from Indiana University with a master's degree in business administration, Ron Blue held a variety of financial management positions. Convinced that Christians would better handle their personal finances if they were counseled objectively by someone with technical expertise and a biblical perspective, he founded Ronald Blue & Co. (RBC), a fee-only financial-planning firm, in 1979. 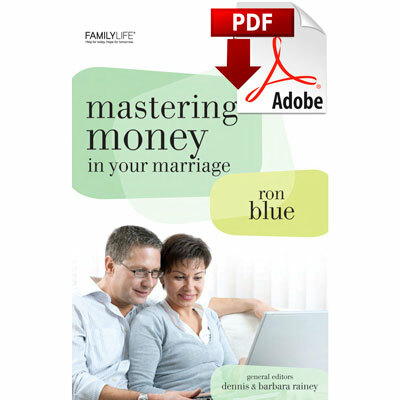 Ron is the author of seventeen books on personal finance from a biblical perspective. Most recently Ron has written Surviving Financial Meltdown. In addition, he has coauthored Raising Money-Smart Kids and A Woman's Guide to Financial Peace of Mind with his wife, Judy. Ron and Judy live in Atlanta. They have five children and eleven grandchildren.